These are a few of our favorites for the month of December. Mens Nightshirt and Night Cap – White: Goodnight, Mr. Scrooge! 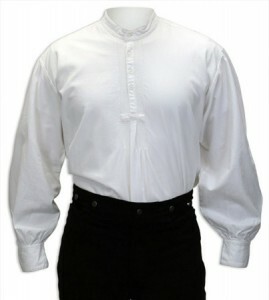 I have been looking for a real Victorian nightshirt and this one fills the bill. It is very comfortable and the perfect sleeping garment on those cold winter nights. It also helps to keep the ghosts of Christmas past at bay. So BAH to you Mr. Scrooge! Due to popular Holiday demand this items is currently Sold Out. Please check back in March for more stock! I wanted to find a shirt Santa might wear in his workshop or under his coat, and was pleased to find these. I love it. And based on the likes I got on my posting and link on one of my Santa Facebook pages, a lot of other Santa’s like em too. Montgomery Vest – Navy: PERFECT! My son – who is a large man – needed a vest for The Dickens Christmas Fair. 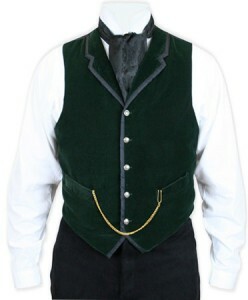 I was not able to find this style of vest in a size 60 anywhere but Historical Emporium. It fit perfectly and both he and I are thrilled at how great it looked. We will be buying more items from you the future! I really love this vest it is the newest of the five I have purchased so far. 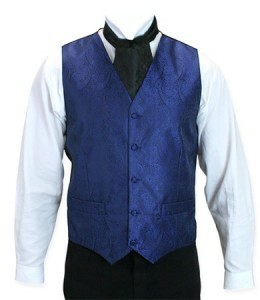 I will say that the velvet makes the vest look very luxurious as well as the satin trim. The color is so rich it almost appeared to be black in color but it is most definitely Hunter Green. I will be wearing it to a Christmas Party in a couple of weeks and on Christmas Eve! These period trousers worked perfectly for the theater costume I wanted to create. The advice of ordering one size bigger than your normal pant size was most helpful and assured that the fit was ideal. I normally wear a 36 waist (35 really) but to be cautious I ordered the Ferndale pants in a size 38. The higher-riding waistline fit me perfectly and once my wife hemmed them, and suspenders were attached, I was totally satisfied with the look and authenticity. The website stated that size 38 was “special order” and could take 10 to 14 days to arrive. Imagine my surprise when they came in 4 days. Great service and great product.